Water demand offset programs tend to be structured so that developers can pay an offset fee and purchase offset credits from the community or water provider supplying the water (rather than engaging in independent work to generate an “offset”). Communities find that this control ensures efficiency and better quality control, and developers prefer it because it is more straightforward and they are not required to find retrofit customers and contractors to do the work (in programs where offsets are generated through retrofits). Existing taxpayers and water ratepayers benefit because new development pays for its water supply and, where the offset ratio is high, significant community-wide water savings are realized. It is critical that a well-developed plan and policy exists so that collected offset fees can be spent in a manner to achieve conservation savings in a reasonable amount of time. 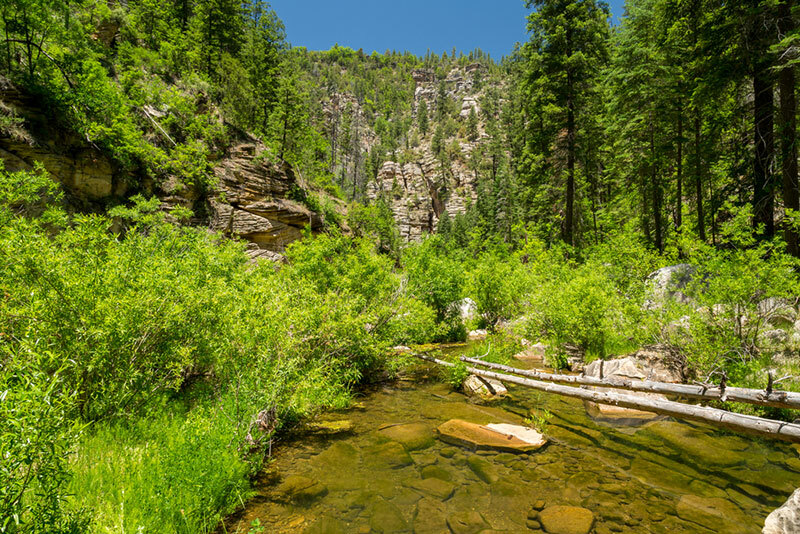 West Clear Creek, one of the tributaries to the Verde River south of the Town of Camp Verde, Arizona. Offset fee programs can be developed to respond to groundwater conditions and water use rates in designated planning areas. San Luis Obispo County, California has an evolving offset program with different conservation and offset requirements in two groundwater basins and a conservation area. In most areas there is a 1:1 offset ratio with a 2:1 offset ratio imposed for discretionary land use permits in certain cases. Developers are responsible for offsetting demand through a number of mechanisms, including by retrofitting plumbing fixtures, participating in a County-operated water conservation program, or retiring the development potential of lots through an agreement with the County or a land trust. The offset requirement must be met at the time of permit issuance. In 2015, San Luis Obispo County adopted a permanent “Urgency Ordinance” for one of its groundwater basins that included a 1:1 offset requirement for new or expanded agricultural irrigation. The ordinance also requires meters on wells serving all new uses, which must be read by the property owner and must be available to be reported to the County. For agricultural uses, offsets can be achieved by showing irrigation upgrades or removing an irrigated agricultural use from production equal to a proposed increase in use. This requires an agreement between the property owner and the County to guarantee that the irrigated agricultural use that has been removed from production will remain that way. Administering an offset program can require a significant amount of staff time, and the program must be flexible to adapt to changing conditions as described in the Case Study. Water use factors must be established for new uses to determine the offset volume and fee. While these water use factors, once established, can apply to most new users, there are always exceptions and new types of users for which water use factors must be developed. Successful programs have resulted in substantial water demand reductions, averted water supply crises, and developed sustainable water supplies. Soquel Creek Water District (SCWD) is a public utility that is entirely reliant on groundwater and serves 40,000 customers in the town of Capitola and surrounding area on the central coast of California. When hydrologic studies showed a groundwater deficit, SCWD chose to institute a water demand offset program, authorized by the California Water Code, rather than declare a building moratorium. Initially, developers were responsible for finding and replacing high flush toilets with the help of SCWD, but the program proved awkward and resulted in SCWD hiring a contractor to do direct install, which was more efficient and ensured better quality control. SCWD established a credit system whereby new applicants could purchase credits for $18,000/acre-foot, which included a 10% staff administration mark-up. This program worked very well but SCWD sold out of credits in 2013, requiring it to consider new water saving programs and to reassess the costs of new supply development. SCWD decided to retain the fee-based system, increased the program multiplier to 2:1, and determined that costs were $45,000/acre-foot. Determining fair and accurate water offset factors, particularly for commercial development, has been challenging and requires good data management and adequate staff time. Since mid-2015, SCWD had charged a fee equivalent to $55,000/acre-foot in recognition that the low hanging fruit is gone and that implementation of more expensive projects are needed, such as a school plumbing fixture replacement program. It is also considering supply development options, such as stormwater recharge and other projects that generate larger amounts of water and take less staff time. However, they have also recently reinstated a toilet replacement program to install ultra-low flow toilets, which is funded by half of the offset fee. SCWD is a special district without planning authority, but it coordinates with the local planning agencies because the program is linked to development. Applicants begin the development process with the County and are then required to get a conditional will-serve letter from SCWD. This order results in some risk by the developer, but is done to prevent the possibility of credit hoarding. Fees must be used for the purpose for which they were collected. SCWD considers the offset program a success because a moratorium was avoided, water conservation savings have been large, especially with the 2:1 ratio, and new development has paid its way, rather than existing water users shouldering the costs. The SCWD Water Demand Offset Program can be viewed here. The Alliance for Water Efficiency “Water Offset Policies for Water Neutral Growth” can be found here. The San Luis Obispo County Offset Program can be found here.